In the last decade the true nature of Wall Street was unveiled to millions of Americans. Those who placed their trust in the system were sorely disappointed when billions of dollars were lost in their 401ks and IRAs. This was the system created and designed by the government to provide for financial security in retirement and it failed millions of Americans. We placed our trust in government leaders who allowed such a system to exist. Today there are 10,000 baby boomers moving into retirement and half of them do not have money to retire on. The issue is not just one of not having saved enough money, it’s bigger. The entire 401k and IRA system does not instill the confidence in Americans to want to put their money there. The choices are limited generally to Wall Street solutions, there is no guarantee of any pension after 40 years of saving, and it is made purposely complex to cloak the true nature of what is going on inside the mutual funds. Only just recently were Wall Street 401ks required to report the fees in these plans. Demos.org recently reported the fees to be in excess of $150,000 over a lifetime. If that is true, that is years of lost financial Freedom. There are solutions and there have always been solutions to retirement income security, but THEY don’t want you to know, and THEY don’t want you to have them. Truth be told, if THEY really wanted Americans to be secure in retirement, there would be many other features of retirement saving available. 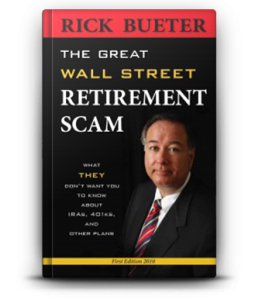 In my book The Great Wall Street Retirement Scam-What THEY Don’t Want You To Know About 401ks, IRAs and other plans I answer all the questions about our retirement system that I, as a credentialed advisor had over the last 30 years. I wanted to know WHY the system wasn’t providing what every American needed in retirement. All that and more is revealed inside. If you have a 401k, and IRA or other government sponsored retirement plan, and you are the slightest bit concerned please consider my book worth reading.